After the game, both of the troops go back each position and prepare of the finale. 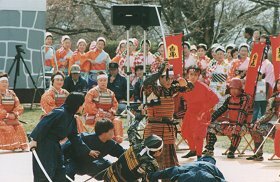 At the finale they hold a traditional dance performance "Hanakoma Odori". And the winner drink a toast troops raise a shout of victory. After that a loser blue troops assult the position of red troops to report against them. Finally both generals join the battle because both troops of Ninjya cannot settle down it. It is difference between the end on 1st day and the end on 2nd day. On 2nd day the blue troops lose the battle, the red troops declare their winning in front of the shogi monument on the top of Mt.Maizuru. After the "Ningen Shogi", they hold another event to play shogi with professional shogi players.